Chōyaku Hyakuninisshu: Uta Koi (超訳百人一首 うた恋い) is a historical Josei manga (manga for girls) written and illustrated by Kei Sugita, and published by Media Factory. The anime adaptation began airing in July 2012 and is ongoing (with a scheduled 12 episodes). Uta Koi is a liberal interpretation of the Hyakunin isshu anthology of 100 romantic poems by 100 poets compiled during the Heian period. It looks into the origins into these writings, majority of them love compositions. 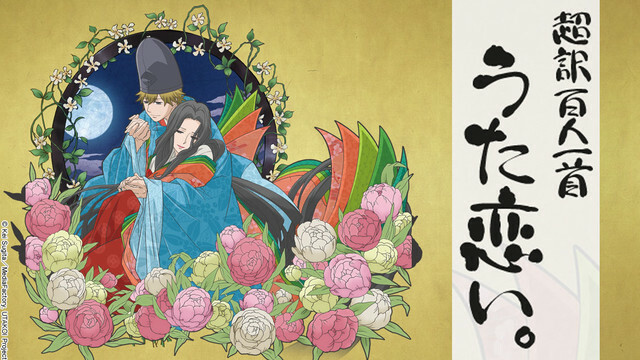 The poems include the tale of Ariwara no Narihira‘s affair with imperial consort Fujiwara no Takaiko, the romantic relationship between Narihira’s brother Ariwara no Yukihira and his wife Hiroko. This series, Fate/Kaleid Liner Prisma Illya, is a spin-off manga series from Fate/Stay Night. The anime is said to air sometime in October 2012. In an alternate life, Illya (Ilyasviel von Einzbern) lives with her older (adopted) brother, Emiya Shirou and her maids Sella and Leysritt. Her parents, Emiya Kiritsugu and Irisviel are avid globe-trotters. Enter Tohsaka Rin and Luviagelita Edelfelt, dueling magi sent by the Mage’s Association to retrieve Class Cards that have the power to materialize Heroic Spirits. Both are armed with Kaleidosticks (Ruby and Sapphire), and when their argument turns ugly and they use the Class Cards in the battle, the sticks abandon them in search of new masters. 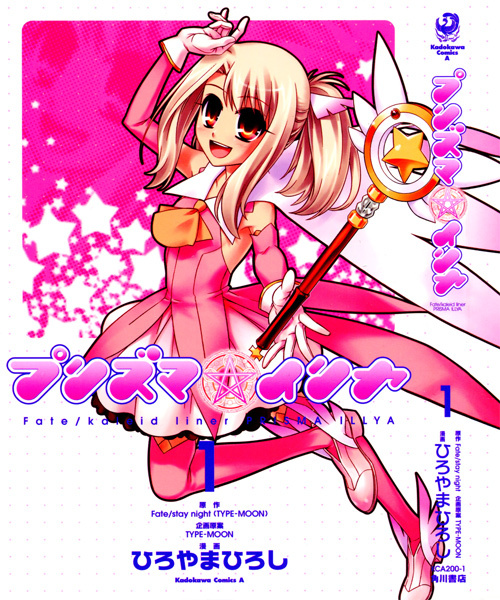 Illya is, unfortunately, forced by Kaleido Ruby to go in contract with it, and she is transformed into the magical girl Prisma Illya. Kaleido Sapphire finds Miyu Edelfelt as the other unsuspecting victim. Hagure Yuusha no Estetica(はぐれ勇者の鬼畜美学 Hagure Yūsha no Esutetika) is a Japanese light novel written by Tetsuto Uesu, adapted into an ongoing manga and later into anime. Babel, an international training organization, is an establishment that protects (and controls) young adults returning from outer world. Ohtorizawa Akatsuki returns from a world of sword and magic, Alazzard, after defeating Satan and brings with him Satan’s daughter, Miu (as his dying wish). The adventures begin when Akatsuki and Myuu, disguised as his sister, have to confront the other “returners” who have psychic powers. Scheduled run date is July 6, 2012. 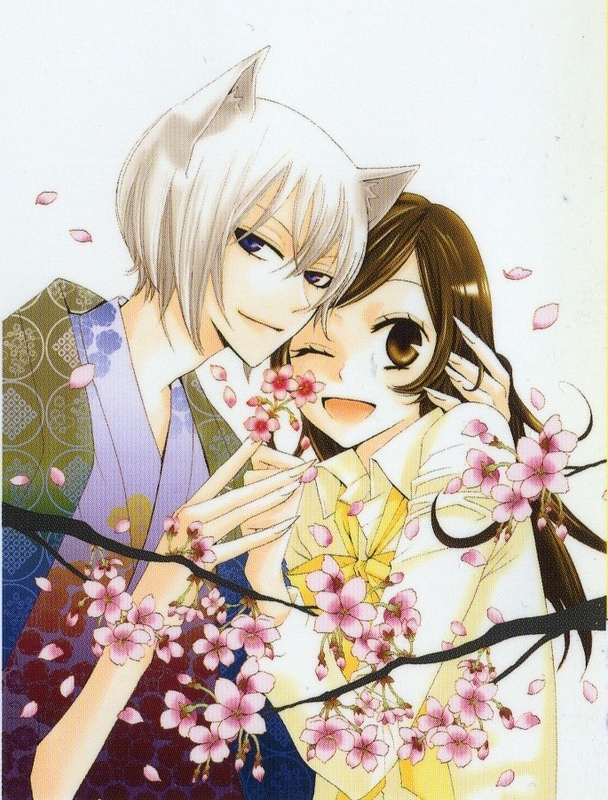 Kamisama Kiss (神様はじめました Kamisama Hajimemashita) is an ongoing shoujou/fantasy manga written by Julietta Suzuki since 2008. The anime adaptation airs Oct. 1, 2012. Teenager Momozono Nanami is left homeless after her father runs away from his gambling debts. She then meets Mikage (unbeknown to her to be a land god of a shrine), whom she saves from a dog. He then gives her his house, a rundown Shinto shrine, which essentially is his way of bestowing the land god mark on her, after finding her better suited to the duty than him. 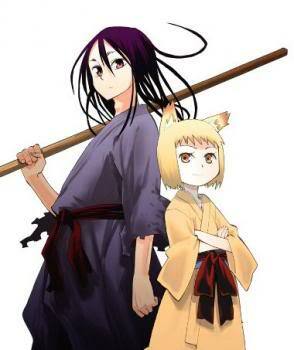 She arrives at the shrine, only to be attacked by Tomoe, a fox demon who serves as a familiar to the land god. He was expecting Mikage’s return after his 20-year absence. Unable to accept Nanami as the new land god, Tomoe leaves the shrine, thus transforming the shrine back into its rundown state. Realizing she is too weak as a god, Nanami leaves but is eventually brought back by Tomoe after she seals a contract with him. Kingdom (キングダム Kingudamu) is a historical manga series written by Tasuhisa Hera published since 2006 and is ongoing. Its anime adaptation aired on June 4, 2012 with a scheduled 38 episodes. During the Warring State Period of ancient China (475-221 BCE) under the Qin Dynasty, war orphans and best friends Xin (信 Shin) and Pin (漂 Hyou) dream of one day growing up to be the “World’s Greatest General.” Pin is, however, is taken into the Palace by a minister and ends being the body double of Yin Zheng (贏政 Eisei), who later becomes Qin Shi Huang. Pin, unfortunately, ends up being assassinated by Zheng’s half-brother Chengjiao, of the Chengjiao Faction. 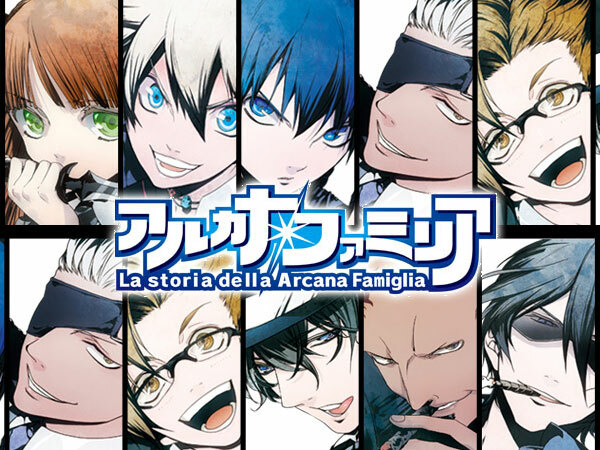 La storia della Arcana Famiglia (アルカナ・ファミリア Arukana Famiria, Italian for “The Story of the Arcane Family”) is a manga written HuneX initially released on October 27, 2011 as a game for PSP. The anime adaptation produced by J.C.Staff began airing in July 2012 with a total of 12 episodes. The organization, Arcana Famiglia, protects an (Italian) island from outside threats and danger (almost mafia-like). The members of the family is made up of people who have made contracts with the Arcana cards, and in turn gain special abilities because of that. On his birthday, the leader of the organization, “Papa,” announces his retirement by giving up his seat to the person who win his daughter’s hand in marriage through a duel: Arcana Duello. Unwilling to accept this forced fate, Felicitá (contract with #6 of the Arcana – the Lovers) announces that she will fight to choose her own path, with her friends Libertà (contract with #1 of the Arcana – the Fool) and Nova (contract with #13 of the Arcana – Death, a young protege and Felicitá’s cousin and once fiancé) by her side. Sengoku Youko (戦国妖狐) is a dated, supernatural manga series written by Mizukami Satoshi published since 2008 and is ongoing. 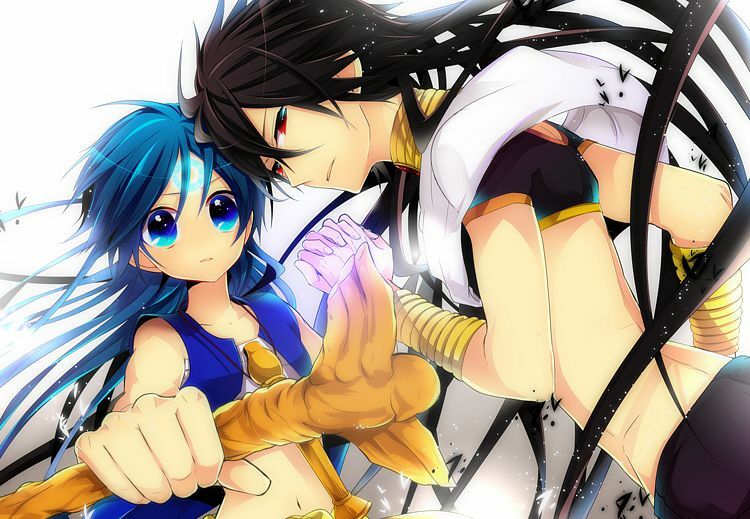 The anime adaptation is scheduled to air sometime in October 2012. This was scheduled but never made it. Demon siblings Youko Tama and younger step brother, Jinka Sendou, are ironically trying to steer people on to the right – holy – path. Along their righteous path of changing the lives of evil doers, they pick up a fearful swordsman, Hyoudou Shinsuke. Suki-tte Ii na yo. (好きっていいなよ。Say I Love you) is an ongoing shoujou manga written by Hazuki Kanae since 2008. The anime airs Oct. 6, 2012. Sixteen-year-old Tachibana Mei has grown up not making friends, believing that people will betray each other sooner or later. One day, she accidentally kicks the school’s Mr. Popular Kurosawa Yamato. For some reason, Yamato takes to Mei and one-sidedly proclaims their friendship. He not only protects her from a stalker, but soon, Mei begins making friends and even returns Yamato’s feelings. Sword Art Online (ソードアート・オンライン Sōdo Āto Onrain) is a Sci-Fantasy light novel series written by Kawahara Reki and illustrated by abec since 2009 and is ongoing. It has been adapted into three mangas, an RPG and a much acclaimed anime series with 25 episodes and ran from July 7, 2012 to December 22, 2012. The anime series is also streamed and simulcasted on Crunchyroll and Hulu. It is 2022. A Virtual Reality Massively Multiplayer Online Role-Playing Game (VRMMORPG) called Sword Art Online (SAO) is released. The players log in simultaneously on November 6 and discover they are unable to log in. Soon they are told by the creator of SAO that if they want to be free, they have to fight their way up to the 100th floor and defeat the final boss. However, if their avatars die in the game, their true self in the real world perishes too. 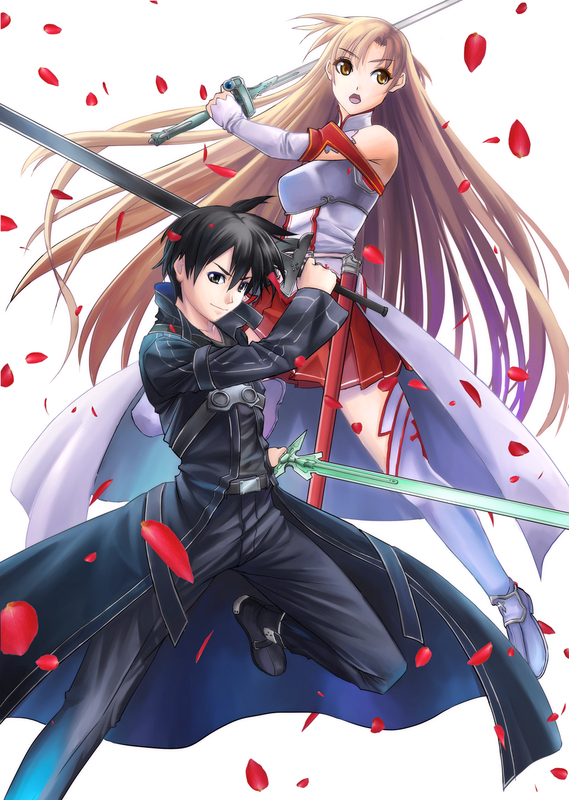 Kirito, the protagonist and a beta tester of this game, meets many friends on the way and even falls in love with Asuna, another skilled player. 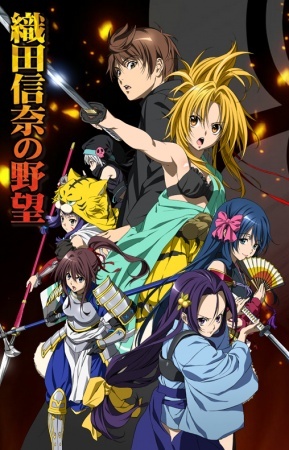 Oda Nobuna no Yabō ( 織田信奈の野望) is an ongoing historical romantic comedy light novel series written by Mikage Kasuga, which will be adapted into an anime series. The series is scheduled to run July 8, 2012. 2. “Hikari” (ヒカリ, “Light”) by Makino Mizuta. It follows 17-year-old high schooler, Sagara Yoshiharu, who is transported back in time to Japan’s Sengoku period. The warriors of the era have all become adorable and beautiful female warlords. Enter Oda Nobuna, not Oda Nobunaga, who tries to conquer Japan with her newly enslaved “Monkey” boy, Yoshiharu (who happens upon the dying Kinoshita Tōkichirō aka Toyotomi Hideyoshi, the known “saru” of Oda Nobunaga, thus unwittingly replacing him). Tonari no Kaibutsu-kun (となりの怪物くん) is an ongoing shoujou manga written and illustrated by Robico. The anime airs Oct. 1, 2012 with a scheduled 13 episodes. Mizutani Shizuku cares only for her grades in school and nothing else. Unfortunately for her, her accidental deliverance of lesson notes to forever absent Yoshida Haru convinces him that they are friends. An innocent and a troublemaker soon find their way to each other’s hearts…but not without any hurdles and third wheels in the way. The twelfth season began airing from Jan. 5, 2012 to present. 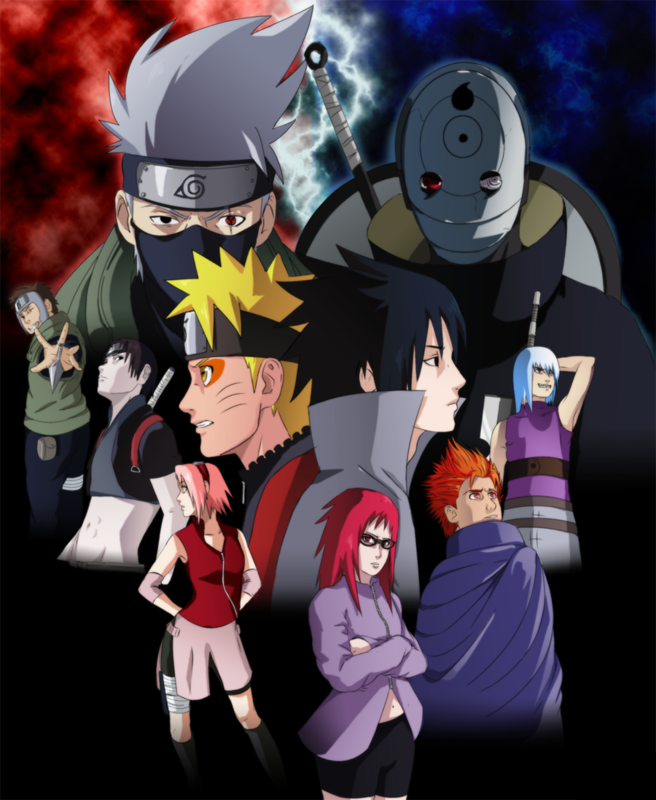 The allies prepare for the Fourth Shinobi World War against Akatsuki led by masked man Tobi. Naruto finally reaches Kumogakure and will be schooled on how to draw on kyuubi’s (Kurama’s) powers. Little Tama-chan (Kawazoe Tamaki) returns with her bokutou to aid Ishida Toraji, the luckless high school Kendo instructor. Bamboo Blade (バンブーブレード Banbū Burēdo) is a manga series written by Masahiro Totsuka, and illustrated by Aguri Igarashi. 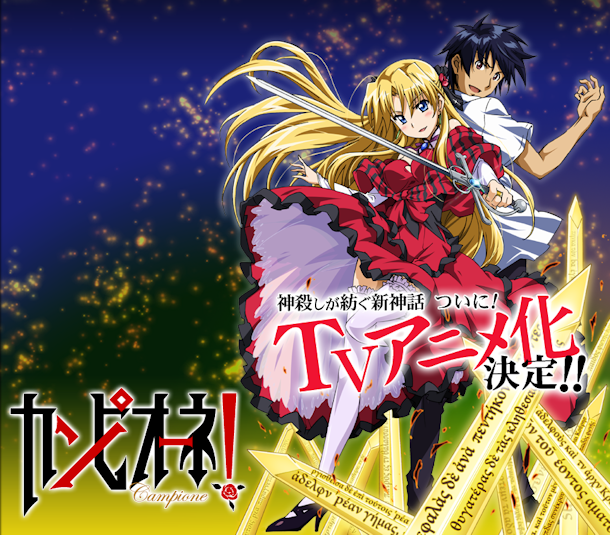 It was first serialized in December 2004 and ended in September 2010. 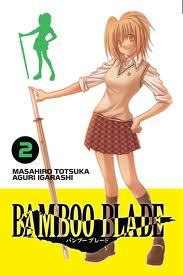 Bamboo Blade B took over in 2008 and is ongoing. 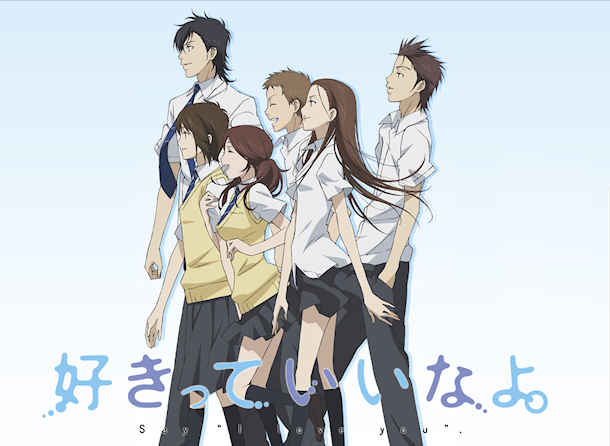 It was adapted to anime and the first season ran from October 2007 until April 2008 with a total of 26 episodes. 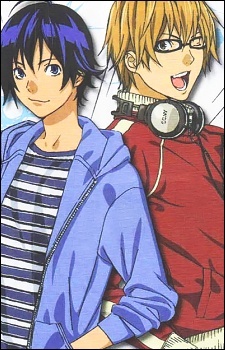 Bakuman is a shonen manga written by Tsugumi Ohba and illustrated by Takeshi Obata (same team who created Death Note). 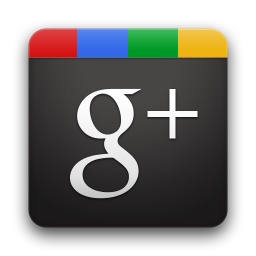 It was originally published August 8, 2008 with the final chapter published on April 23, 2012. The anime adaptation is produced by J.C. Staff, which originally ran October 2, 2010 until Spring 2011, with a total of 25 episodes for the series. Season 2 aired from October 2011 until March 24, 2012 with a total of 25 episodes. Season 3 of the series is scheduled to return in October 2012. Reluctant and disillusioned by the fate of his uncle as a mangaka, Mashiro is sucked into the Takagi’s dream after his crush Miho reveals she too wants to be a voice actor for animes. They promise to marry each other only after achieving their dreams. So begins Mashiro long and arduous journey of becoming a famous mangaka. After three unsuccessfully launches or different titles, can Mashiro still stay strong and follow through? This is not only an entertaining series, it’s extremely educational and shows the struggles of the manga world. This series, a third installment, is a prequel to Hakuouki Shinsengumi tells the story of the dawning of the Shinsengumi. It is scheduled to air July 2012. Two new movies are also scheduled for 2013. In 2008, Hakuouki Shinsengumi Kitan was released as a new generation of otomegame (simulation love games for girls) for PlayStation 2. The illustrations of characters was done by Kazuki Yone. Even though the game was yet to be released, a 15-page artbook was first produced by Dengeki called “Girl’s Style.” The series is part historical part fiction. 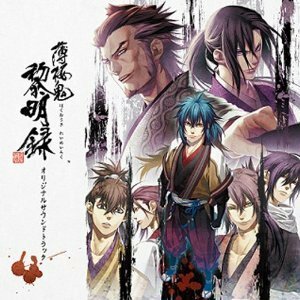 Most of the characters are true Shinsengumi persons depicting their stations during the historical and political period (Kondou Isami, Hijikata Toshizou, Inoue Genzaburou, Okita Souji, Nagakura Shinpachi, Saitou Hajime, Harada Sanosuke, Todou Heisuke, Yamanami Keisuke and Yamazaki Susumu). The first season aired from October 2010 to December 2010 with 10 episodes. Second season of Hakuouki took off in October 2010 and ended December 2010. The protagonist, Yukimura Chizuru, is the daughter of a doctor who works in Edo. The father leaves Edo to work as a volunteer doctor and moves to Kyoto without his daughter. As time passes by, Chizuru starts worrying about losing contact with her father, so she decides to go to Kyoto in search of him. 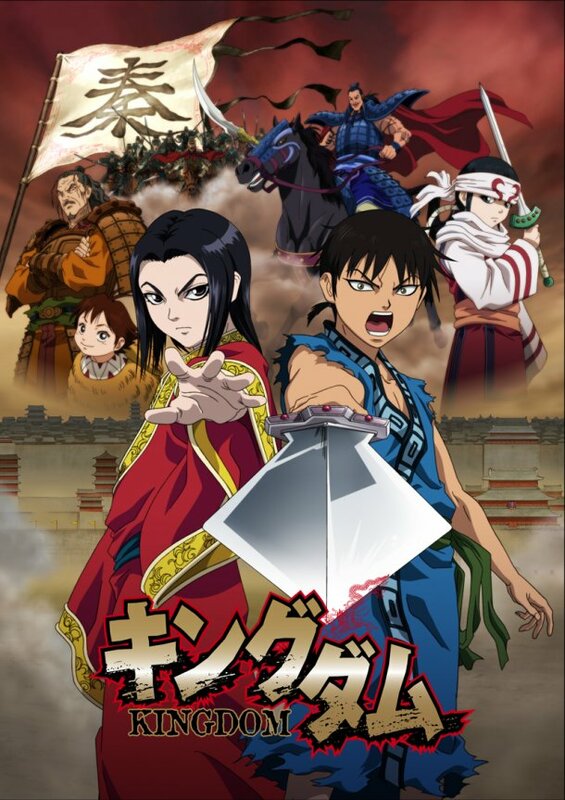 On the way, Chizuru is attacked by few criminals and witnesses a fight between an oni and the Shinsengumi. Taking her into custody and saving her, the Shinsengumi debate on what to do with Chizuru when they discover that she is the daughter of the doctor they are also looking for. So they decide to become Chizuru’s protectors and help her look for her father(the doctor). Lots of events happen while she stays with the Shinsengumi, as they discover mysterious secrets and fight against the Bakumatsu group. The story is overall romantic with a historical and political background. 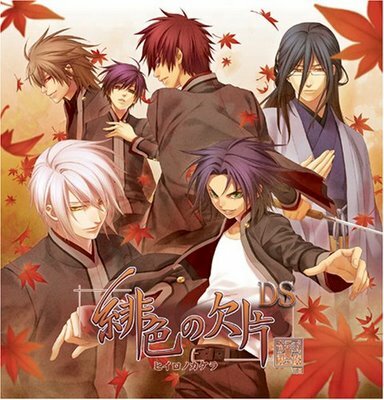 Hiiro no Kakera (緋色の欠片 Scarlet Fragment) is an otome game (directed at the female market, much like Hakuouki Shinsengumi: both created by Idea Factory) released in 2006. 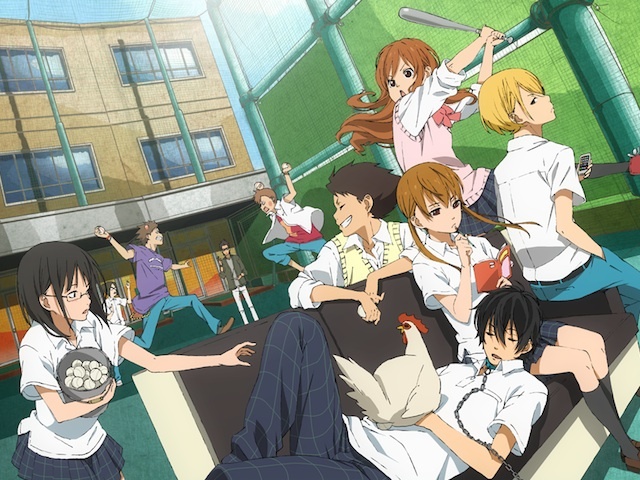 The first season premiered in April 1, 2012. Season 2 begins Sept. 29, 2012. The anime adaptation of this romantic series centers around Tamaki Kasuga, a 17-year-old high school girl who inherits the post as the next Tamayohime, guardian of the sword Onikirimaru. She returns home to her grandmother only to be saved by one of her five Guardians, Takuma Onizaki (her classmate who is a descendant of the oni). Her other guardians include upperclassmen Atori Mahiro (controller of the wind) and Komura Yuuichi (descendent of the nine-tailed fox controlling illusions and spirit fire), underclassman Inukai Shinji (has the power to heal and the use of words), and the unofficial leader, Oomi Suguru (descendent of the giant snake, controller of water and able to forge powerful seals and barriers). Much like Hakuouki Shinsengumi, Tamaki is well protected by her “boys.” Even though they outwardly find being her guardian troublesome, they do take their duty very seriously and eventually come to see her as an equal and even respect her. Caught this series on my second trip to Japan, with one eye open after a truly exhausting day of galavanting around Tokyo. S1 ends with Tamaki’s powers as the Tamayori Hime awakened. What awaits her and her guardians as they continue their vigil of the sacred treasures and fight against the powerful Logos. Moyashimon もやしもん is a manga series created by Masayuki Ishikawa and has been serialized since August 2004. 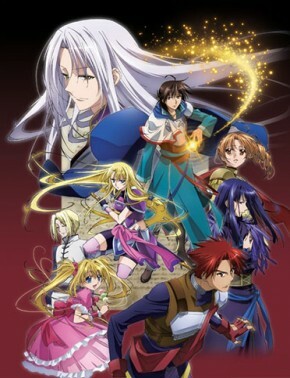 The first season of the anime adaptation aired from October to December 2007 with 11 episodes. 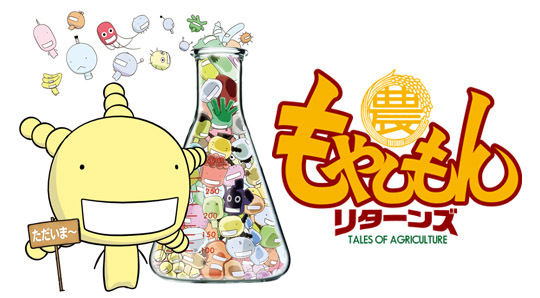 The second season, Moyashimon Returns, will air July 2012 with a scheduled 11 episodes. Agricultural college student Sawaki Tadayasu has the unique ability of seeing and communicating with bacteria and microorganisms. This series is a continuation of the Legend of the Legendary Heroes following the exploits and heroic acts of Ryner Lute and Ferris Erris in their quest for the relics of a Legendary Hero. The second season of this series is rumored to air in October 2012. The Legend of the Legendary Heroes (伝説の勇者の伝説 Densetsu no Yūsha no Densetsu) is a Japanese light novel series written by Takaya Kagami, and illustrated by Saori Toyota. It was first published in 2002 until 2006 with 11 volumes. Its sequel, The Great Legend of the Legendary Heroes (大伝説の勇者の伝説) was published in 2007 with a total of 9 volumes. The first animated adaptation of the series was aired in July 2010 with a total of 24 episodes. 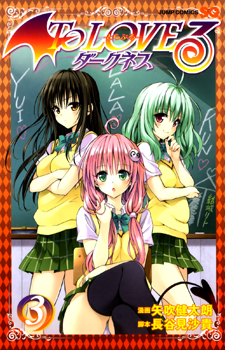 To Love-Ru (とらぶる Toraburu) is a manga series written by Saki Hasemi and illustrated by Kentaro Yabuki. It was serialized from April 2006 to August 2009 and has a total of 18 volumes published. 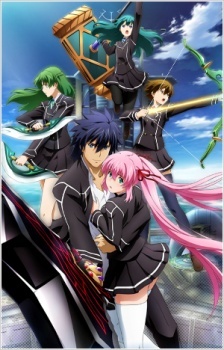 The first season of this anime adaptation was aired in 2008 with a total of 26 episodes. The second season, “Motto To Love-Ru,” was aired in 2010 with 10 episodes. The third season, “To Love-Ru Darkness,” is scheduled for this October 2012. Rito Yuuki, a high school student, has the (mis)fortune of meeting an alien girl Lala who chooses him as her husband. Unfortunately for him, Lala has many suitors and intended fiancés picked by her father. His situation worsens when Lala’s father rules that if Rito in unable to protect Lala, he will not only loose his life, but Earth will be destroyed too. You said there is going to be a season two of Bamboo Blade, and in air on october 2012.
sorry – at the time of posting, that was what it said was happening. but i guess it never came through. It’s too bad it never came. yeah – i would have loved to watch it again. 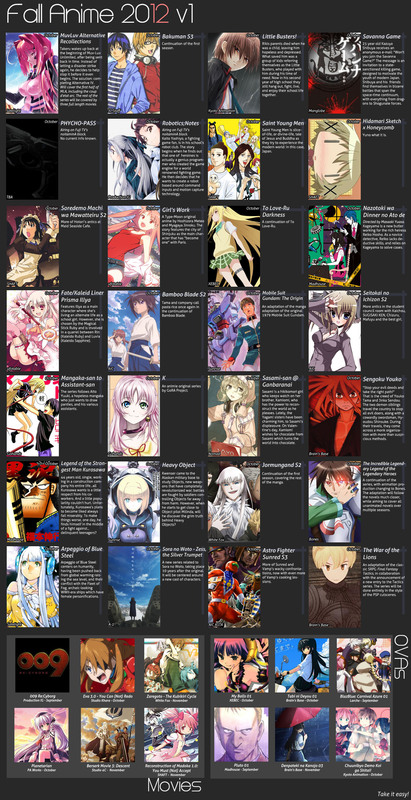 Check out the new list for anime 2013.